I would like to welcome Paul Klimpel in this guest blog on cultural heritage, film history and copyright. Paul stresses the importance of good regulation for preserving our cultural heritage. Preservation by ensuring legal access instead of locking it away – a welcome reminder as we are discussing copyright reform for Europe. I met Paul at a roundtable discussion at the Lisbon Council in Brussels and appreciated his enthusiasm for film, and for finding solutions rather than obstacles. Dr. Paul Klimpel (photo Bart Goossens mbargo.be), born 1970 in Minden, got involved with cultural organizations in the 1990s. He joined the Museum of Film and Television (Deutsche Kinemathek) in 2002. Between 2006 and 2011 he worked as its administrative director. 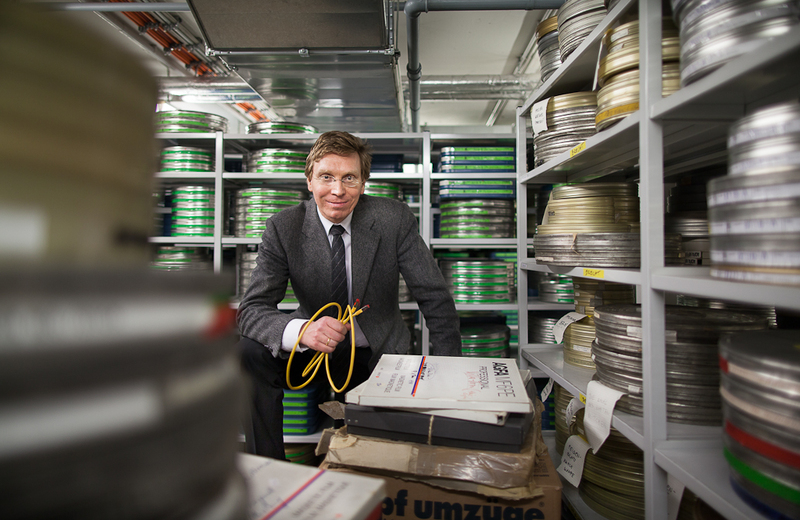 He was also chief executive of the German Network of Multimedia Resource Centres. Since 2012 he has been working as a lawyer. Europe has a rich and diverse culture heritage. This heritage is the base of our common house of Europe. It is also important for Europe's place in the world. Its impact on Europe's reputation is huge. But Europe's cultural heritage is jeopardized by copyright confusion. Without reform, Europe's culture will not keep up in a digital world. For public institutions preserving our cultural heritage like museums, archives or libraries it is very difficult and often even impossible to give access to their holdings in a digital world – at least, if they act according to the law. The same holds true for new commercial exploitations of cultural heritage. The reason is simple: In order to use cultural heritage, the copyright status has to be clarified. And clarifying the copyright status of an old work is very difficult. It is laborious. It is costly. And very often it is simply impossible. The transaction costs for copyright clearance are often so high that license fees appear as a negligible size. With older works it is often unclear who holds what rights in it – this is particularly true with regard to the rights for digital uses. Just take an old film, a silent movie, like the famous Metropolis. It is almost impossible to clear the rights for example for streaming such a film. Every use of a work protected by copyright must provide an exhaustive sequence of rights assignments from the creator to the user. But these assignments are complicated. Copyright can be assigned – covering single actions or usage rights or, alternatively, generally for all kinds of uses. Both of this can be assigned exclusively or non-exclusively, for a limited period or for an unlimited period. Certain kinds of uses may not be transferred. Some legal systems did not allow the transfer of rights for future forms of uses – which digital use often is. But let's go back to the old film. Different creators like the director, the cameraman or the cutter acquire their own copyright. The producer tries to unite all rights. If today an older film is to be used, it must be researched which rights the creators have assigned to the film producer and whether the film producer has resold these rights again later in real terms. The longer the sequence of legal transactions is, the higher is the risk that certain rights are not transferred to a sufficient extent. In copyright, a bona fide acquisition does not exist. All contracts must be diligently analyzed in detail. This includes the contracts between the creators and the film producer as well as the following contracts for all forms of copyright transactions and licensing of the film. More often than not the old contracts are lost, so rights cannot be cleared reliably. But even if the contracts still exist, they do not have clauses with regard to uses which were unknown in the 1920s, such as streaming. Rights clearance is therefore often simply impossible. This differs from the legal situation in the U.S. with its famous film industry. The work made for hire doctrine leads to a clear bundling of rights by the film producer, including rights for uses unknown at the time of the production. Additionally, the U.S. had a system of mandatory copyright registration before they entered the Berne Convention in 1989. As a result of this registration requirement, it is usually very clear who holds the copyright in older works. If today the American Motion Picture Association of America is lobbying against copyright reform in Europe, they also defend the American dominance by preventing Europe's film heritage to arise from invisibility in the digital age caused by copyright confusion. Archives, museums and libraries are particularly affected by the legal uncertainty with regard to older works. But the content industry is also affected. Rights clearance means high transaction costs – with no benefit for the creators. As a result of this legal situation, either old content is not used in the digital age. That is the rule in Europe. Or the law is ignored. Risk management replaces rights clearance – especially commercial firms take this route. Business models with older content usually lack a sound legal basis. Instead, they are based on accepted presumptions and copyright fraud. Copyright reform with respect to cultural heritage is not about expropriation of right holders – it is about ending a situation of copyright fraud, presumptions and fictive writing up of rights. All examples for mass digitalization of cultural heritage on a large scale avoided legal assessments for each and every item. Mass digitization in the U.S., like the Google Books Project or other projects like the digitalization of the Internet Archive are based on fair use. The digitalization project of the Norwegian national library is based on a national agreement with rights holders within a tradition of extensive collective licenses. In a report on orphan works and mass digitization in June 2015, the copyright office in the U.S. pointed out that mass digitalization is hard to manage on the basis of rights clearance of each and every item and they called for legislative actions. The legal situation in Europe is even worse. Only reforms that avoid legal assessment, that avoid high transaction costs will boost our cultural heritage. It is time to decide: Will the European Union find a way out of copyright confusion or will Europe's cultural heritage become increasingly invisible in the digital world?